Undated poster stamp on Tripod. "A new format in graphics and advertising caught the eye of the world at the turn of the century. Miniscule in size, universal in appeal, and blazing with all the varied colors of the rainbow, this was the poster stamp, an esoteric rarity among collectibles. As the name suggests, it is a poster in stamp form. Always gummed and a little larger than the regular postage variety, these stamps normally were printed up in perforated sheets so they could easily be torn apart and stuck to invoices, envelopes, and correspondence, or simply collected as sheets into albums. Increasing business through advertising simplicity was the main intent of poster stamps, but they also brought high art to the masses on a level that could never have been achieved otherwise. 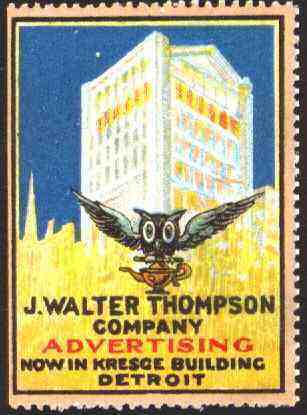 Poster stamps were the common man's art gallery."